The Brumbies have called the University’s Bruce campus home since 2013. University of Canberra students and Brumbies staff are set to be the big winners of a new partnership between UC and Brumbies Rugby, as the university becomes the club’s official Education Partner. In a move that signals an important step forward in the pair’s long-running relationship, the partnership paves the way for greater interaction between the two organisations. Under the new Alliance Agreement, students and researchers at the University will have more opportunities to work with Australia’s most successful Super Rugby club. Vice-Chancellor and President Professor Deep Saini described the arrangement as unprecedented in scale, with students and staff set to become the biggest winners. 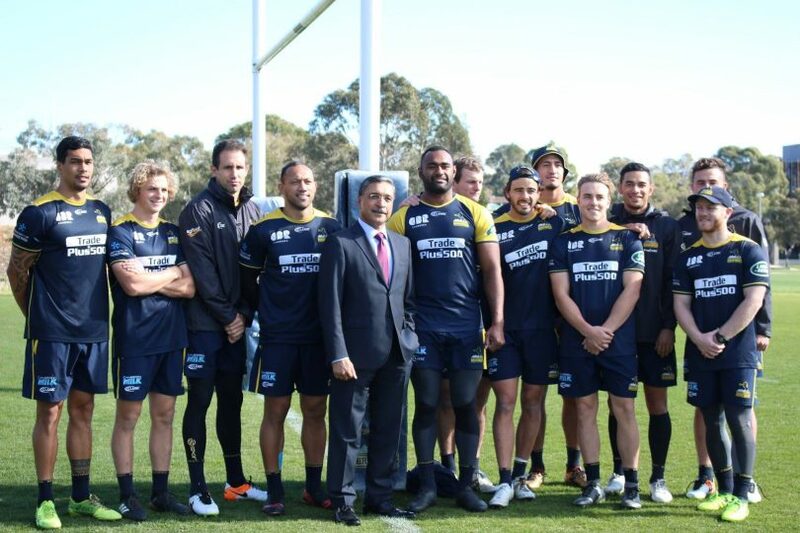 “The University of Canberra has enjoyed a long and fruitful association with Brumbies Rugby and we couldn’t be more excited to enter this important next stage of our relationship,” Professor Saini said. “As the official Education Partner of the Brumbies, our students will have greater access to practical work opportunities which will enhance their learning experience and better prepare them for the workforce. The Brumbies have called the University’s Bruce campus home since 2013. Since then, the two organisations have forged a close relationship with many mutually beneficial outcomes. Staff and PhD candidates from the University’s Research Institute for Sport and Exercise (UCRISE) have long worked with the club to keep it at the forefront of injury prevention and rehabilitation. UCRISE researchers and Brumbies’ coaching and performance staff are currently using Australian-first technology to accelerate the recovery of players who have suffered concussion. Students studying degrees in marketing, media, physiotherapy, and sport and exercise science, among other disciplines, will also benefit from an expanded internship program. Some students who have previously undertaken work experience at the club are now employed on a full-time basis. Both organisations will benefit from increased brand exposure under the partnership, while students will also have access to discounted memberships via the University’s official supporter group, the rUCkus Crew. Brumbies Rugby Chairman Phil Thomson said he was looking forward to strengthening Brumbies relationship with UC. “We are delighted to have signed the Alliance Agreement with the University of Canberra and are looking forward to strengthening our already very good relationship with them,” he said. “We have a tremendous facility on-site here at the University, so it is natural that our relationship should be mutually beneficial to both parties. We have been in discussions with the University around the Alliance Agreement for some time and are happy that we have been able to sign the agreement. The University is an elite athlete-friendly institution and counts some of the country’s top sports people among its students and alumni. Veteran Brumbies prop and former Wallaby Ben Alexander obtained a degree in sports media at the University and is currently studying a Master of Business Administration, while several other players are also undertaking tertiary study at the University.